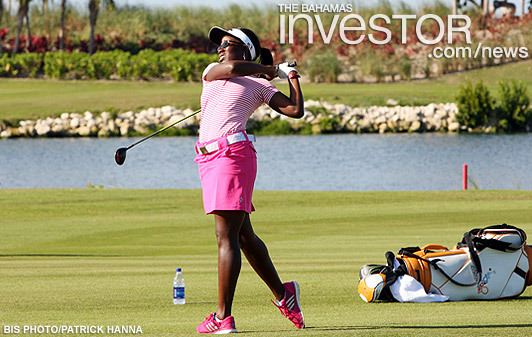 Bahamian golfer Georgette Rolle, 28, is participating in the 2014 PureSilk-Bahamas LPGA Classic being held at the Ocean Club Golf Course on Paradise Island this week. A few hours before teeing off in the competition, she said her aim was to stay focused and get in the game early. It is the second time Rolle has participated in the tournament having made her debut last year. She said it was an enlightening experience playing with some of the best female golfers in the world. Rolle and other golfers got the opportunity to guide students in basic skills and techniques during a Junior Golf Clinic held prior to the tournament. Rolle said that she hopes the tournament will jump start her year, as she plans on playing in 10 events in 2014. While continuing to pursue her golfing career, Rolle plans to further impact Bahamian youth ages six to 18 through the Georgette Rolle Junior Camp. A graduate assistant coach since 2007 for the men’s and women’s golf teams at Texas Southern, Rolle is also an LPGA Teaching and Club Professional Class A member. She is a two-time champion of the Bahamas National Amateur Championship in 2003 and 2007, and also was the National Minority Champion, Women’s Independent Division, in 2007. She started her professional career in 2008. She stated playing the game since the age of seven. “Big events such as this serve to spark interest not only in the country, but in our youth,” she added. Rolle also said that she sees the upcoming IAAF World Relays Bahamas 2014 as another way sports tourism can thrust the country into the global sporting spotlight. “We are aware of the impact these huge events have on the country,” she said. With gold currently trading 34 per cent below its September 6, 2011 peak, this chart provides some long-term perspective on this millennium's gold market. Deputy Prime Minister and Minister of National Security Philip Davis gave the keynote address at the opening of Bahamas Financial Services Board's three-day forum in Exuma yesterday.